Download these Invasive/Early Detection/ Reporting Apps on your mobile device! 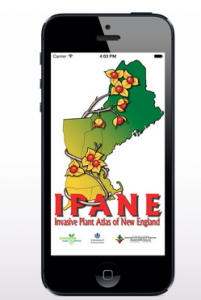 The Invasive Plant Atlas of New England’s (IPANE) mission is to create a comprehensive web-accessible database of invasive and potentially invasive plants in New England that will be continually updated by a network of professionals and trained volunteers. The database will facilitate education and research that will lead to a greater understanding of invasive plant ecology and support informed conservation management. An important focus of the project is the early detection of, and rapid response to, new invasions. This app allows IPANE to become mobile and allow IPANE users to report sightings of invasive plants directly in the field. 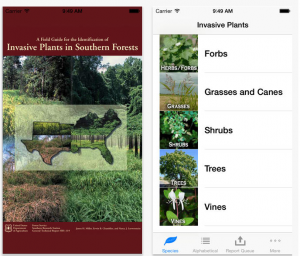 This app allows you to report invasive plants in National Wildlife Refuges. This includes Great Swamp National Wildlife Refuge, Edwin B. Forsythe National Wildlife Refuge, Parker River National Wildlife Refuge, Great Meadows National Wildlife Refuge, Silvio O. Conte National Fish & Wildlife Refuge (Pondicherry Division) and Rachel Carson National Wildlife Refuge. 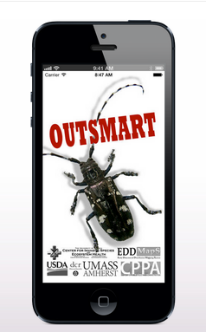 The Outsmart Invasive Species project is a collaboration between the University of Massachusetts Amherst, the Massachusetts Department of Conservation and Recreation (MA DCR) and the Center for Invasive Species and Ecosystem Health at the University of Georgia. The goal of the project is to strengthen ongoing invasive-species monitoring efforts in Massachusetts by enlisting help from citizens. The web- and smartphone-based approach enables volunteers to identify and collect data on invasive species in their own time, with little or no hands-on training. 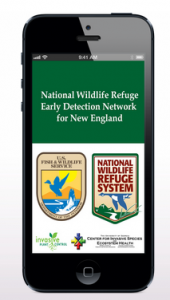 By taking advantage of the increasing number of people equipped with iPhone or digital camera/web technology, this approach will expand the scope of invasive-species monitoring, and is an effort to help control outbreaks of new or emergent invasive species that threaten our environment. 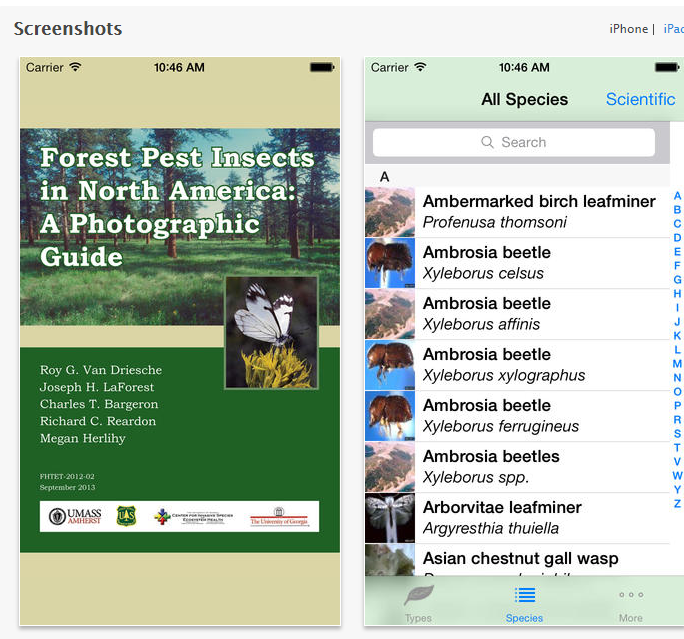 The photos present in this App are intended to help foresters, urban landscaping employees, or others working with trees recognize some of the common pest insects affecting trees in North America and understand their life cycles and how they damage trees. The information was drawn from book, websites, factsheets, and some original literature. This App is not a guide for specialists. In many groups, such as the bark beetles and aphids, confirmation of species identity requires attention to details not visible in photos with comparisons to other similar species and use of keys. Sources for further information (websites and articles) are given at the bottom of each species’ page. nonnative plants into forests of the Southern United States continue to go unchecked and only partially unmonitored. These infestations increasingly erode forest productivity, hindering forest use and management activities, and degrading diversity and wildlife habitat. Often called nonnative, exotic, nonindigenous, alien, or noxious weeds, they occur as trees, shrubs, vines, grasses, ferns, and forbs. This app provides information on accurate identification of the 56 nonnative plants and groups that are currently invading the forests of the 13 Southern States. Recommendations for prevention and control of these species is provided from the booklet, “A Management Guide for Invasive Plants of Southern Forests,” published by the Southern Research Station as a General Technical Report. Basic strategies for managing invasions on a specific site include maintaining forest vigor with minimal disturbance, constant surveillance and treatment of new unwanted arrivals, and finally, rehabilitation following eradication. fruits that attract birds or is an annual that self seeds, so it doesn’t need to be replanted every year. Unfortunately, many of these plant traits desirable to gardeners can also increase the likelihood that a plant jumps the garden fence and invades natural areas. Invasive plants threaten our environment and economy. They pose an enormous threat to our native plants, animals, and ecosystems, and they cost the United States approximately $35 billion per year (www.invasivespecies.gov). Although invasive plants are almost always not native to a region, it is important to note that most non-native species are not invasive. We use the following definitions. Native (indigenous): A species that was present in North American prior to European settlement or has arrived since through natural means of dispersal. Non-native (exotic, alien, introduced): A species that was brought to North America by humans, either deliberately or accidentally. Invasive: A non-native whose introduction does or is likely to cause economic or environmental harm or harm to human health (from Federal Executive Order 13112). People have introduced invasive species both accidentally and deliberately. 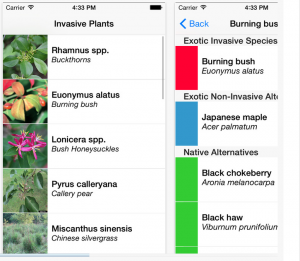 This app focuses on plant species that are used ornamentally and have become invasive in at least part of the Midwest. Cultivars or hybrids produced from these species may or may not be invasive. In the few published cultivar evaluation studies, some cultivars prove to be more invasive than the parent species, others less or not invasive. We lack research about cultivar invasiveness for many of these species. When we have good evidence about a problematic or relatively benign cultivar, we list those specifically. Suggested alternatives include both native species and non-native species that currently show no signs of becoming invasive. Download the Rain Garden App. “Rain Garden” is a FREE app designed to help you properly install a rain garden at your home, office, or job site. Through video tutorials, diagrams, text, and tools, the App guides you through determining the size and placement of your garden, selecting plants, digging and planting your garden, and maintaining your garden. It also includes tools for determining your soil type, measuring the size of the area that will drain to your garden, and managing multiple rain garden projects. 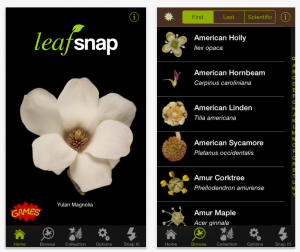 Leafsnap contains beautiful high-resolution images of leaves, flowers, fruits, petioles, seeds, and bark to aid identification. These high-resolution images were created by the conservation organization Finding Species. 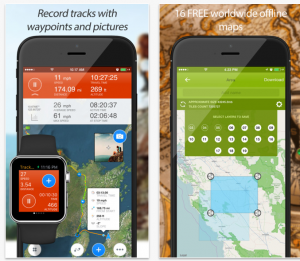 Leafsnap currently includes trees found in the Northeastern United States and Canada. The inclusion of Canadian trees is through collaboration with the Canadian Wildlife Federation, with support from TD Friends of the Environment Foundation.